Ensures that all centralized procurement conforms to University policy and applicable laws. Oversees the management of all tenders and contracts. Acts as an internal consultant for centralized procurement. In partnership with on-campus businesses, promotes best business practices. The Assistant Director of Operations, Louis-M. D’Aoust with the support of three Procurement Officers, manages the Operations sector. The table below indicates the number of quotations required based on the transaction category and the maximum amount for opening a call for tenders. Please see Procedure 4.3 for more details. Is the purchase made with research funds? If the good or service is a Canadian Foundation for Innovation (CFI) research project or other research project, read Section 7 of Procedure 4.3. Please consult with the Research Sector of Procurement Services regardless of the project’s cost. Is the value of the purchase over $5,000? Consult the University or CAUBO negotiated contracts. Prepare an electronic requisition in FAST WebReq. 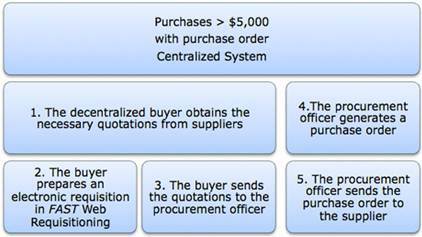 A PS procurement officer generates the purchase order and sends it to the supplier. Consult Section 4 of Procedure 4.3. Place the order and pay the supplier by entering the payment into Banner. NO – This is a decentralized purchase; please see 25 to 28 of Procedure 4.3 for more detailed instructions. Please order with the purchasing card wherever possible. Does it involve a restricted commodity? Dangerous products: substance or product prohibited or limited by the Hazardous Products Act RSC 1985,c.H-3. Controlled products: products, materials and substances that are regulated by WHMIS legislation (e.g. compressed gas, flammable materials, etc.). See Policy 37 for the list of items. These items require a purchase order. Consult the Risk Management. Complete the appropriate type of form for this type of product and forward it to the Manager of Radiation and Biosafety for approval and signature. See Policy 37 or Policy 87, Physical Resources Service, Computing and Communications Services (CCS). Does it involve an item exempt from Policy 36? If it involves an item exempt from Policy 36 (Travel expenses, book purchases, etc.) see Appendix C of Procedure 4.3. Does it involve consulting services (consultant)? Note: Derogations require the recommendation of Procurement Services and the approval of the President. Does the Service provider meet all consulting services elements? If not, he becomes a non-consulting service provider (Service provider). Does it involve a service provider over $5,000? The appropriate number of quotation for the global amount value of the contract. Contract must be attached to a Web requisition for purchase order. A copy of the contract must be sent to Procurement Services. Note: Derogations require the approval of the Director of Procurement Services. Do I pay an invoice?